Once, before law school, before I grew up, but after marriage and kids, there was a brief, shining moment when I dreamed of being a baker. I even owned a book, which is the only recognized means of indicating a dream is serious. Thanks to unbridled bursts of dedication and creativity, I had an elaborate and diverse portfolio. Cookies, breads, biscuits, cakes-I could do it all. Some time ago, I believe it was two weeks, I promised to make a cake for a friend's birthday. 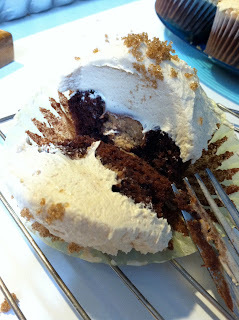 I was in the zone, having created a sinful, chocolate-chip cupcake with peanut buttercup filling and peanut butter frosting just a week before for another friend's Quadranscentennial. That's a mini-peanut butter cup in the middle. Admittedly, I was rushed. I went for the box cake, which I never do, but this box cake was from a celebrated Baltimore cake-master whose reality show was only recently canceled to make room for more shows about horrible parenting. I trusted, and that was my downfall. This was no average cake. It had complicated instructions designed to create a zebra pattern that is just so hot with the young people right now. Because of several personality defects exacerbated by a year of law school, I followed the directions with the same gravitas and perfectionism normally reserved for defusing bombs. The cakes came out of the oven, but not out of the pans. This was unfortunate, but not fatal. While I trimmed off the round tops, I noticed with satisfaction the distinctive zebra pattern. As is the right of any baker, I tasted the trimmings. They tasted of nothing but sweetness. I knew there would be a trade-off to using a box cake. There was no sense in turning back now. As the cakes cooled, I examined the tub of frosting. 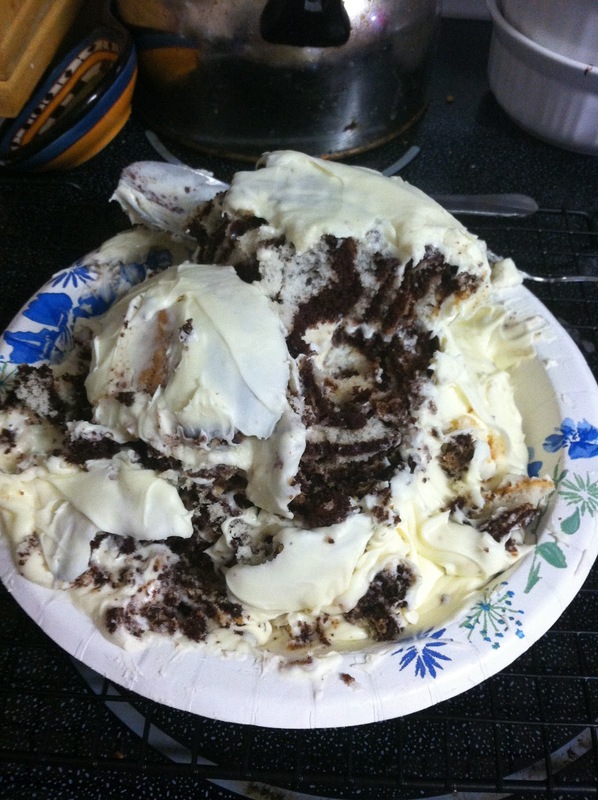 Amazingly, there was no dairy in buttercream frosting, which is why it should only be consumed straight out of the container while drunk, lest that conundrum be contemplated and the space-time continuum tear asunder. The frosting process did not go well. 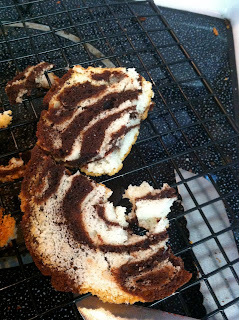 With every deft swipe of my frosting-covered knife, more cake fell off like leprous zebra flesh. The globs of mystery fats overwhelmed the fragile structural integrity until the upper hemisphere just slid into the oblivion of my glass-top range. And I followed my creation into the darkness. There is a scene in Gone With the Wind where the camera pans on an infinite field of carnage. My baking troubles were not of the same magnitude, but I have the coping skills of a Southern damsel, so there was no telling me that. In my desperate attempts to save the cake, I had used every clean piece of cutlery at my disposal, throwing each aside like a combat surgeon. All in vain. It got worse because we ate some. That knife is just unsettling. Defeated, I asked my Rhett to inform the party that there would be no cake and that I would, biting my fist, purchase a cake. I was informed cupcakes would be acquired without hassle and without my assistance. I retired to my bed. After briefly deciding to skip the party, I dismissed the thought as histrionic. Instead, I made a dress out of my drapes and held my head high. Another, stronger, woman wouldn't have let this setback end her dreams. She would have scraped the congealed frosting off the stove and tried again tomorrow. That woman doesn't have 6-figures worth of debt and 100 pages to read before yesterday. That woman can bake my cakes from now on. As God is my witness, I will never bake again. 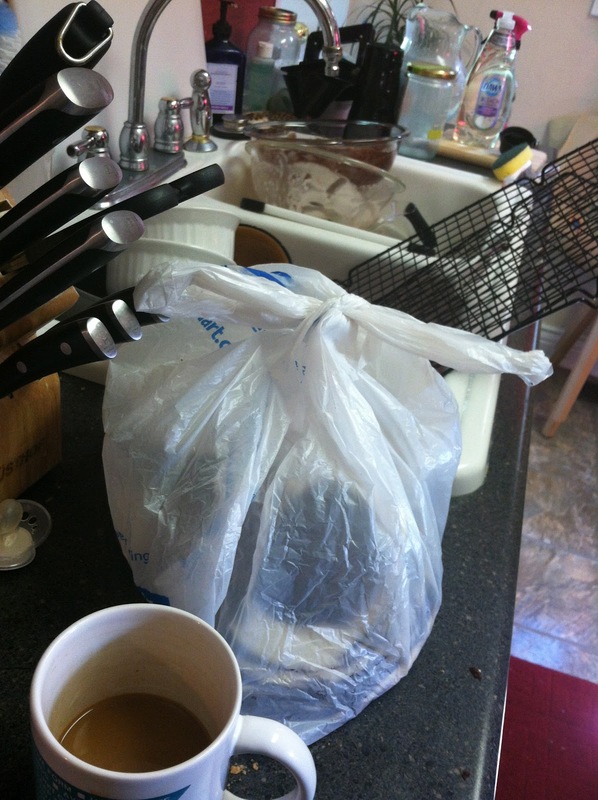 Leave no trace...except the dishes. You read that right. This month, all the posts on the challenge grid are family-free. How can I resist an excuse to continue to ignore my family? Hilarious! The cake looks perform for making those new cake lollipops that are all the rage. Or just eating straight from the pan with delightful abandon. I think you are right. The cake is perfect for novelty. I have never made the cake pops. I assume you need a special pan? 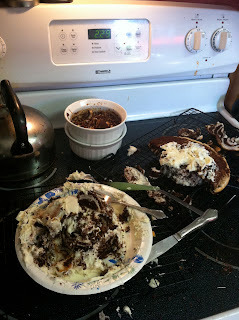 In all honesty, this is not my first baking related meltdown, but it was the worst particularly because I can't blame it on pregnancy hormones. Shiftless Husband is a good cook, but he rarely bakes, sadly. Never baking again...until my birthday next year? How about we just go throw eggs at the Ace of Cakes shop. It's like 2 miles from the law school. Get it? "beats" and "eggs"?! And they say law school dulls the wit. Love this post with all its humor and great Southern references. I adore baking, I live to bake, and therefore I'm devastated all out of proportion when I have a failure. I cry. I whine. I feel unworthy. But my need for my own homemade desserts wins out eventually. That cupcake thing looks divine, by the way. Thanks! Those cupcakes were pretty good. I had to send the extras away or I would have eaten them until I went into diabetic shock. Why is baking so emotional? I think it is because you put so much into it and then some part of the magic doesn't work and the whole thing goes to seed. Glad I'm not alone in my dramatics. I had about 3 forkfuls. I got sick after each one, but I kept coming back. I can't take that frosting. Funny stuff, Liz. And I mean the humor of your story, a testament to your writing. I'm not laughing at that mess on your stove. Ok, maybe a little. I give you credit for your attempt. I am terrible at baking. I've done this. The cake comes out looking ok and then you try to apply the buttercream frosting and disaster. I haven't had the courage to try again. I loved your line, should be consumed straight out of the container while drunk, lest the space time.... Hilarious. That looks like a cake that I would make. My 16 year old is the baker in my family. Of course you went to law school....I have a sixth sense for adoring bloggers who have that experience. And zebra stripes are hot....Hmmmm. I had no idea. No one tells me anything. I love your use of pictures. This line: I even owned a book, which is the only recognized means of indicating a dream is serious.
" 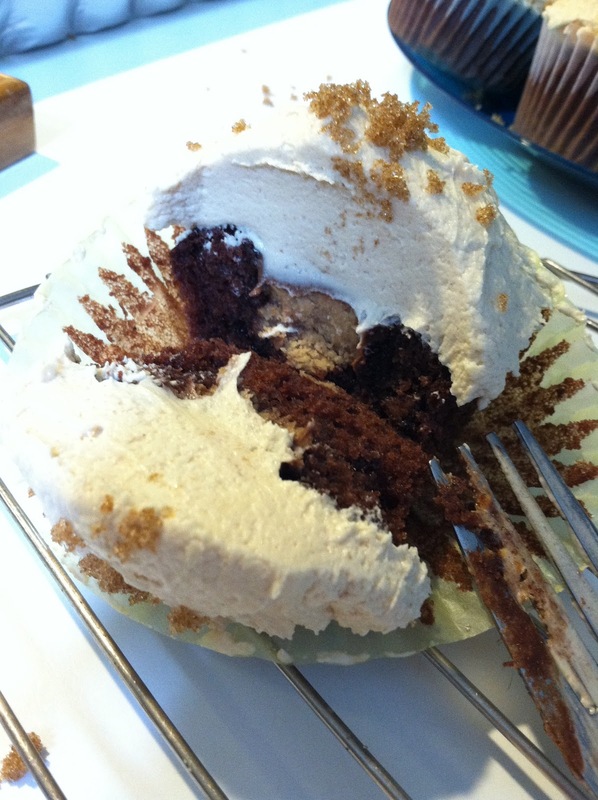 there was no dairy in buttercream frosting, which is why it should only be consumed straight out of the container while drunk, lest that conundrum be contemplated" Yes! I am guilty of having contemplated this dairy conundrum. And really of the exact cake-pacolypse you describe. HILARIOUS post!!!!!! Ha!!!! I don't care how defeated you are...I am starving now!!!! I love to bake but don't do it very often. I was sad for you, but laughing at how wonderfully you told the story with such a great sense of humor! Oh, you'll break and bake again. I've heard women say almost the same thing after childbirth. I once harbored dreams of being a baker as well! Cake trauma is the worst. But it looked delicious, even if it wasn't all together. I really want cake now. Lots of great line in this!! This is why I only cook. Our two oldest daughters love to bake. I can't tell you how many times I've gone down to the kitchen to see a scene as you depict here. Apparently, they have no baking pride or ego...they leave it all out for us to see, clean up and throw away. LOL! Fantastic melodrama. I'm so glad you understand that it's okay to eat frosting from the can. My husband thinks I'm insane. I think you could do without the italicized parts at the beginning. You get enough info from the story, and it just slows the story down. Love the Scarlett references. Wonderful.